OK. I am fairly new to the Java world (I have spent most of my time with .NET). I have a project that is running in a Windows environment under the IntelliJ IDE and everything seems to work the way I want. Now I would like to deploy to a Linux Ubuntu server and run the code there. To make sure that it runs what all do I need to copy? I am assuming that I need the compile class that contains 'main' as well as all of the classes that makeup my packages. This brings up my first question cann all of the class files that are part of the packages in the project be somehow combined so I just need to deploy one class file? If not what is the directory structure expected? Or do I just need a CLASSPATH environment variable that includes the classes of my package? Now what about the various jar files that make up the external libraries? What if I want to make my own JAR file? Thanks for help on these rudimentary questions. You should package your files at one of standard java formats depending on your application type - jar, war or ear. The ide can help you here via artifacts subsystem. Then you can simply deliver that archive to your linux box and launch it there. 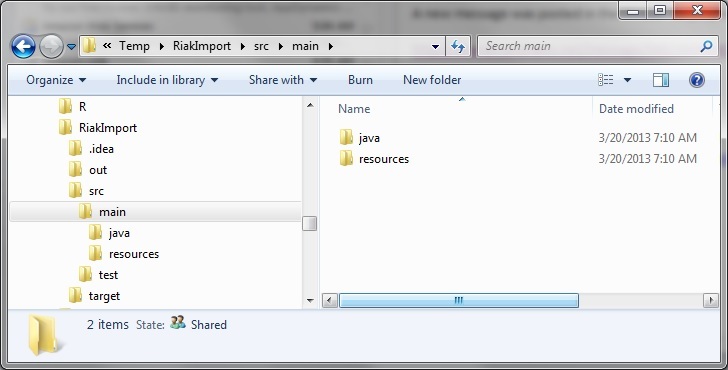 The folder RiakImport has a file called App.java that was created when I started the IntelliJ project (new project). This file contains my main. I have added a number of .java files to this same level but right now even though they are deining objects they are not recognized. However, once this is over come I would like to create a package with this files that I have added but I am not sure how to do this so the files and their contents are recognized. Ideas? As far as the original question. Where do I find the project properties? I can get to 'Project Settings' and under Atifacts there is an arrow that gives me two menu choices. Either 'Empty' or 'From mondules with dependencies'. I have not created a "module" so how does that play with Facets, Artifacts, and Packages? I'd recommend you to check out any existing pre-configured open source java project in order to check how a project is organized. I created an 'artifact' but I don't see that a .jar file was produced. Now what am I missing? Did you try to build the artifact via main menu | build | build artifacts? You need to include instructions about your application's entry point (a class with main() method) into the jar in order to be able to execute it via 'java -jar'. It's defined under 'Main-Class' key at jar's manifest - http://stackoverflow.com/questions/2848642/how-to-setup-main-class-in-manifest-file-in-jar-produced-by-netbeans-project. I have attached what the artifact looks like. I looks like the Main-Class is defined? It looks so (assuming that class name is App and it's located at package RiakImport). 'Created-By: Apache Maven Bundle Plugin' means that that is not a jar created by IJ. This is the Jar that I checked. It is the only RiakImport.jar that is available. I have attached a "history" of screen-shots of what I see. You can sumbit a sample project, I'll take a look. Here is the whole folder zipped up. It is rather large. Looks like a bug at our new compiler. Please uncheck 'project settings | compiler | use external build' as a workaround. follows this behaviour. To fix the problem you can move META-INF directory to main/resources. I don't have a main/resources folder. Then you need to create it (http://maven.apache.org/guides/getting-started/index.html#How_do_I_add_resources_to_my_JAR). On a side not you really need to fix the web page. I cannot post to the forum at all. I continually get an error that it is an empty page, 'there is an error, please check below', or a prompt to leave the page after the post message. 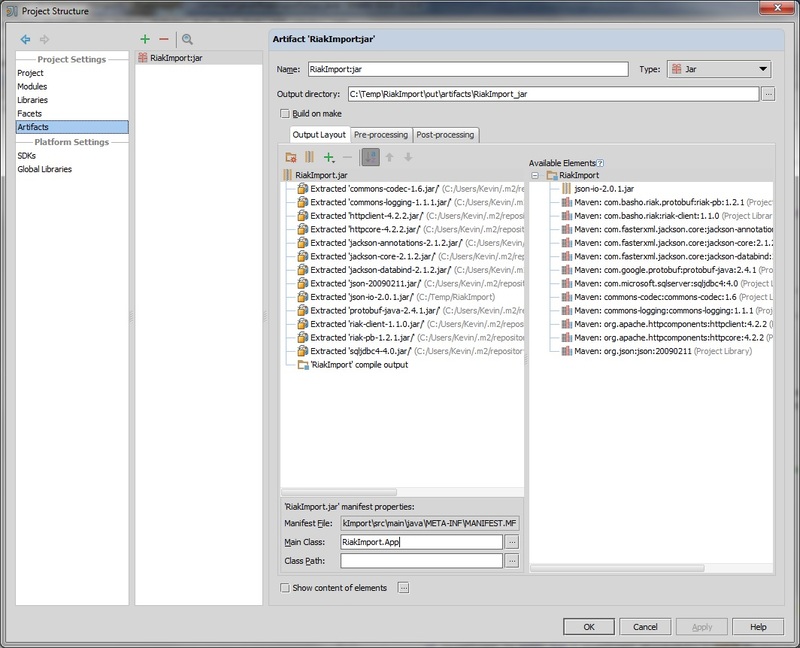 artifact using 'From modules with dependencies' item and choose 'copy to the output directory and link via manifest' option. That was the only option I had to create a .jar "From modules with dependencies". I am unclear what needs to change. I have attached my project. If I move one of the .jar files then I get a whole lot of undefined symbols. default and 'copy to the output directory and link via manifest' which you need to select instead. Like I indicated earlier I created a new artifact (the project was attached) with this second option. But as I indicated I am not out of the woods yet as I still get a Java exception (again reproduced in an previous post). proper Class-Path attribute to the right location (src/main/resources/META-INF). I moved the manifest already as a work-around to an issue with IntelliJ that is known and being worked on (my understanding). It is in the right place right? Now what is the right Class-Path attribute? And how is it specified? You have the whole project I just want it to work the same as it does when running from the IDE. I have attached a screen shot of where I currently have the resources folder. Sorry but this forum is not a right place for studying java. I'd suggest you to check jar file specification, try to build the *.jar manually and ensure that it's working. As soon as you have a clear understanding on what is really going on under the hood, you can setup tooling (ide) for automating the task. We would be glad to assist when you know exactly what do you want to achieve and just can't figure out how to do that at the ide. I am not studying Java. I am trying to get IntelliJ to generate a .jar fle that works and so far have been unable. If you are unclear what i am trying to achieve I simply want to run the program that I have the same way that it runs under the IDE. generated manifest.mf to main/resources) or recreate the artifact again and choose main/resources folder in 'Create Jar from Modules' dialog. 3) Move the manifest file to the main/resources folder. 4) Create an artifact with the 'copy to the output directory and link via manifest' option selected and pointing to the moved manifest folder.